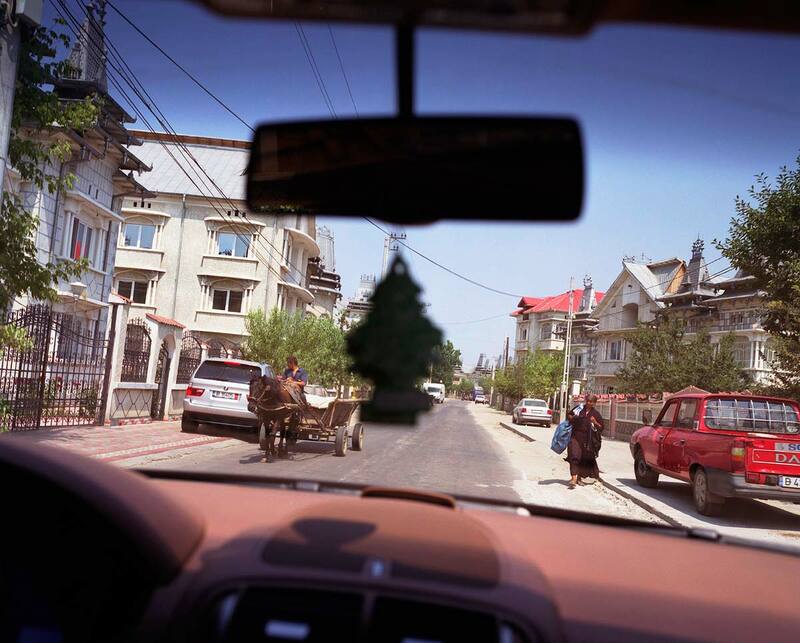 The view of the main road that runs through Sintesti as seen from inside 18 year old Radu Toma's new Porsche Cayenne 4-wheel drive jeep, in the village of Sintesti, in Romania, early August 2006. The men of the village all favor German makes of vehicles, believing them better than others, and if they can not drive themselves (due to the inability to read and write during the driving test examination), then they hire chauffeurs to drive them. Sixteen years ago this road had fields on either side, now expensive houses compete for attention and expensive cars drive past the more traditional horses and carts. The Kalderari roma of Sintesti are by tradition metal workers, originally making alcohol stills, pots and pans, but now dealing in scrap metal. The large profits from their business have enabled them to build large houses in the village of Sintesti, 20km from Bucharest, and to invest in fast, Western brand name cars such as BMW's, Mercedes and Porsche.